Want to buy a mobile phone, but cannot decide between GSM and CDMA? Know the difference between the two technologies. Advanced technologies have taken the world to a greater level and mobile phones are the biggest example of the same. They are becoming a symbol of style and status these days. Today, there are numerous mobile phones and service providers available in the market. Therefore, buying a phone has become a difficult task. When you plan to buy a mobile, first thing that strikes your mind is its features and applications. But choosing a network is equally important, as each of the networks today come with its own share of exclusive features. While some have excellent rate plans, there are others that promise great connectivity, still others that come with enhanced features and superb customer care service. Two major network technologies of wireless communication today are- the Global System for Mobile Communications (GSM) and the Code Division Multiple Access (CDMA). Although in terms of technology, CDMA is more advanced, GSM provides value added features and thus, has a larger share in the market. If you are planning to gift yourself a cell phone in the coming days and are confused as to which service provider to opt for, this article would be of help. 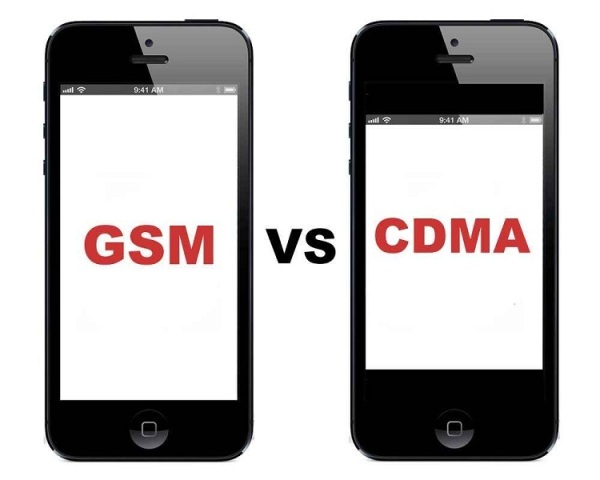 Read on to know the difference between GSM and CDMA. GSM stands for Global System for Mobile Communications. It came in the market in the mid of 1980’s and generally operates in the 900 and 1800-MHz bands. In U.S, it is operated on 1900-MHz band. The users of GSM use Subscriber Identity Module (SIM) cards for the connection with the service provider. SIM cards are small in size, with removable memories and hold a lot of data and numbers of identification which are required to access any wireless service provider. SIM card is bound with the network, instead of the handset. It can be easily interchanged with another GSM phone by just swapping it out. GSM works on the basis of Time division multiple access (TDMA). TDMA allots a specific time period on a specific frequency to the GSM. GSM network connections are considered better secured than CDMA. GSM divides its frequency bands into many channels, so that a large number of users can make a call through a single tower. GSM covers up to 82% of the global market. There are numerous handsets and service providers available in the market. They come with a variety of plans with cheaper call rates, free messaging facility, limited free calls and so on. The quality of call in GSM is better and also better secured than CDMA. A number of value-added services such as GPRS, are making GSM a perfect choice. The consumption of power is less in GSM mobiles. With the tri- band GSM, one can use the phone anywhere around the world. The per-unit charge on roaming calls is higher in GSM than CDMA. Calls made through GSM mobiles can be tampered. If the SIM gets lost, one can lose all the data, if the same is not saved in the phone. CDMA stands for Code Division Multiple Access technology, which is completely distinct from GSM system. CDMA is used as the second and third generations of the wireless communication. CDMA system operates on 800-MHz and 1900 MHz bands of frequency. In this system, voice signals are digitized over one another and the output is spread out over the whole frequency bandwidth with the sequence codes. The data is sent in small packets over a specific number of the discrete frequencies, which can be used anytime within the specified range. Thus, it is a form of spread spectrum. It does not use the SIM card, rather gives a specific serial number to the handsets. CDMA systems use multiple access schemes, which are pioneered by QUALCOMM, etc. The call costs are cheaper than GSM. Call quality is better than GSM system. The phone calls are more secured because of the spread spectrum. Very few number of CDMA handsets are available in the market. It has only a few service providers, which can be uncomfortable for the customers in case of low service level. If you want to upgrade the CDMA phone carrier, you will have to deactivate the present one and activate the new. In doing so, the phone with the initial carrier becomes useless. If you are frequent overseas traveler, the CDMA coverage is sure to make you upset. Now with this difference between GSM and CDMA, you can easily study which network connection will be more beneficial for you and thus, make a wise choice.